I hope everyone is having a splendid weekend. I thought I would do a little beauty product review of some eyeshadow palettes and mascara I am currently obsessed with & have been using the past month! 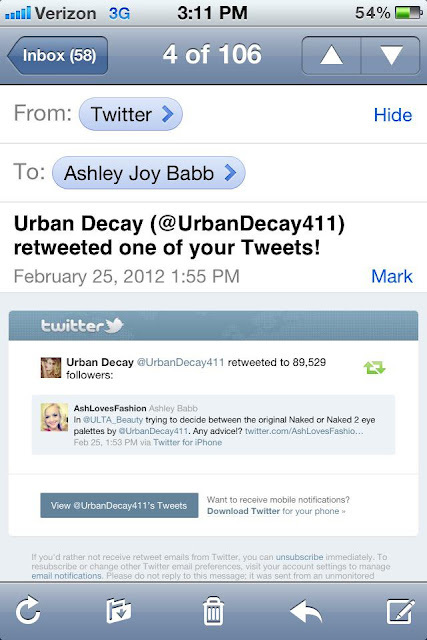 At the end of February I went to Ulta Beauty Supply (one of my fave stores for makeup besides Sephora) with one mission in mind: to pick up one of the Urban Decay Naked or Naked 2 eye shadow palettes. I have heard so much hype over the years about these great eye shadows but I had yet to buy one. However with a $50 Ulta gift card I received from a best friend for Christmas I thought this would be the perfect time to try one of these palettes out! Two AMAZINGLY pretty palettes with beautiful colors!!! Oh no! I thought it would be an easy and obvious decision but that was not the case. To help me solve my dilemma, I did what any social media fashionista would do: I decided I would ask my Twitter followers for their help! 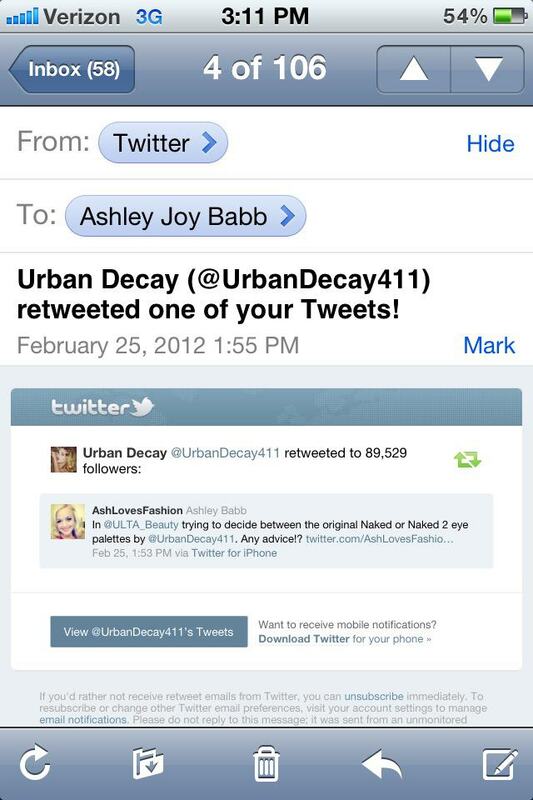 Well Urban Decay saw my Tweet and re-tweeted it for all of THEIR almost 90,000 followers!!!! How helpful was that!? Suddenly I started getting Tweets from people all over the country giving me advice….and the majority said…. With my $50 gift card and not being able to turn down great advice I decided that it would be the best option to just get both!!! So buying both is what I did…. After using both now the past weeks, I can TOTALLY understand why people said to buy both. While the colors may look similar they are definitely different, so I thought I would share with you my favorite looks from Naked & Naked 2 and try to point out what I like about each of the palettes. 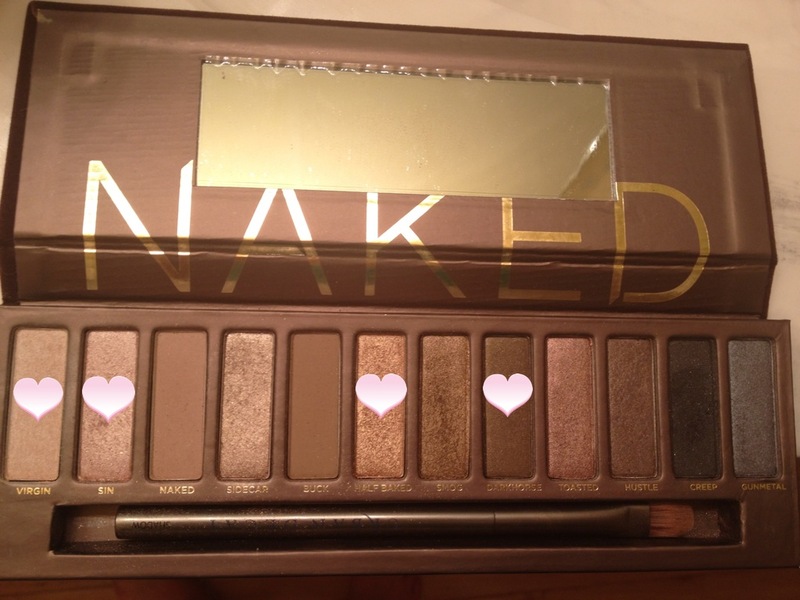 Here are the colors in the original Naked palette (with hearts marking my favorites)…. -Long-lasting (I put this on in the morning & still there after a long day). -It offers an extra grey/black shade that the Naked 2 palette does not have. -More bronze & gold colors which are beautiful! 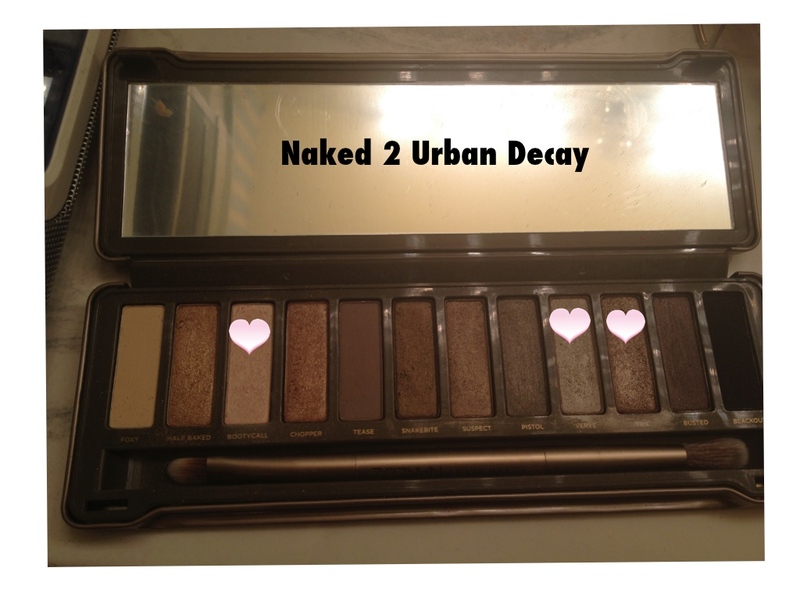 Here are the colors in the Naked 2 palette…. -I like the eyeliner “Blackout” better than the eyeliner in Naked called “Creep.” It is darker black without the shimmer which I prefer. -The eye brush included is double-sided as opposed to the one in the Naked palette, with one side made for the crease and the other for use all-over the lid. -It is also long-lasting like the Naked shades. -The mirror is SO much better which comes in handy when traveling. In conclusion, while you can’t go wrong with either palette, Naked 2 is my absolute favorite. Both are fabulous but I find myself using the Naked 2 palette more. Have any of y’all tried the Urban Decay Naked eye shadow palettes? What do you think? Check out the Naked Palette HERE and the Naked 2 Palette HERE. Thanks so much for reading dolls!! !